Located in Eastern Arizona on a long, lonely stretch of desert highway between Flagstaff and Albuquerque, lies the unassuming Petrified Forest National Park. A ways off the hard beaten tourist path, those who discover it will be rewarded with an up-close experience in geology and a fascinating case study in human behaviour (more on that later). 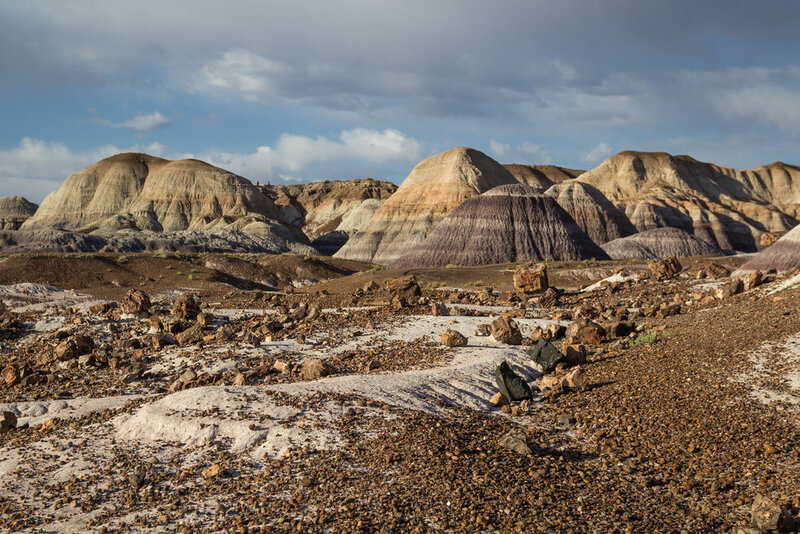 Most notably, Petrified Forest National Park has the greatest concentration of petrified wood on Earth. 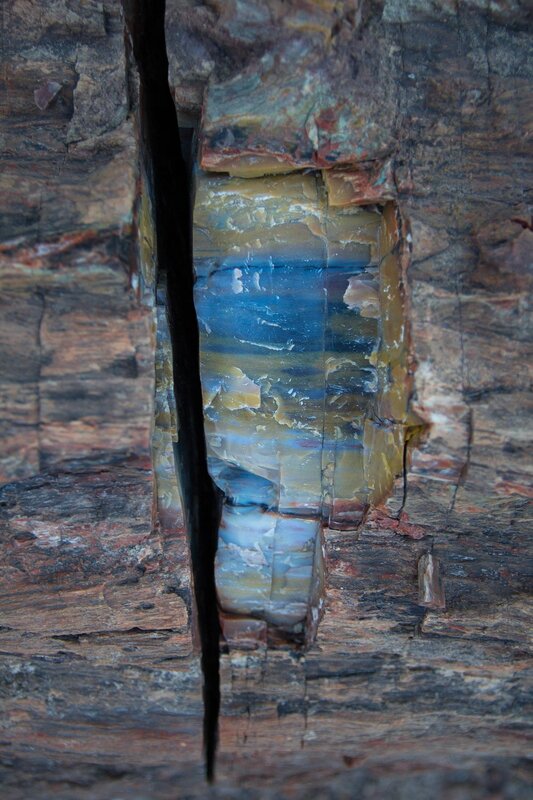 Petrified wood is a fossil where the original organic plant material has been replaced by stone. Unlike other types of fossils which are typically impressions, petrified wood is a three-dimensional representation of the original organic material. 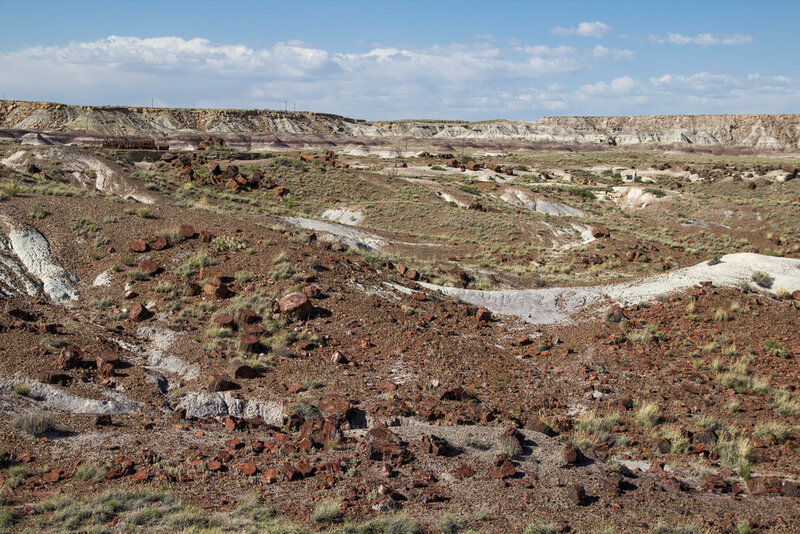 A petrified forest is an area with a large concentration of petrified wood that has been left behind from an ancient forest that no longer exists. 225 million years ago, when North America was part of the supercontinent Pangea, the land that is now Arizona was a tropical jungle located along the equator. The trees, some over 200 feet tall, sat along a river system where they were ripped out by frequent flooding and forced into logjams downstream. Overtime the logs were buried by volcanic ash and sediment. Silica rich waters seeped into the logs effectively sealing them from decay and replacing the original wood cells with quartz. As the quartz crystallized, contaminants including iron, copper, cobalt, manganese and carbon turned the colourless crystals dazzling shades of red, orange, yellow, purple, blue and black. 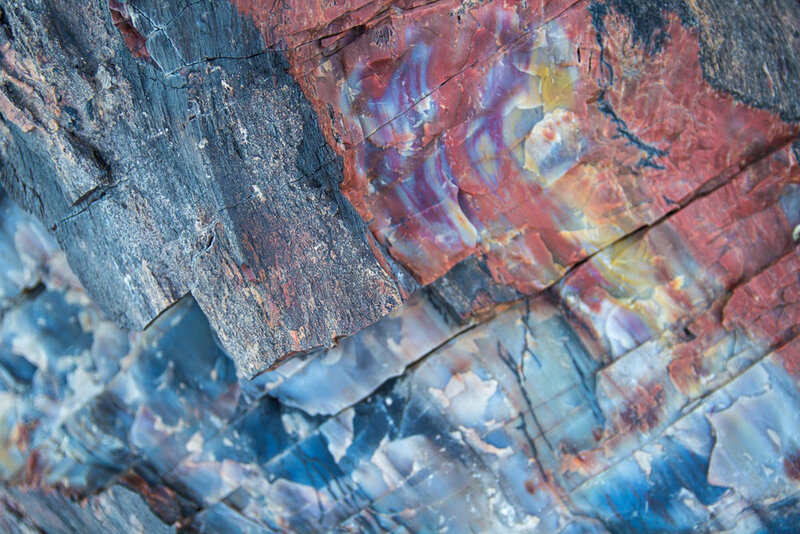 Over the past hundred years, many people have been unable to resist the temptation to take a piece of petrified wood home as a souvenir. The park was often understaffed and unable to patrol the trails for theft, especially in the wake of the opening of Route 66 which ran directly through the park. 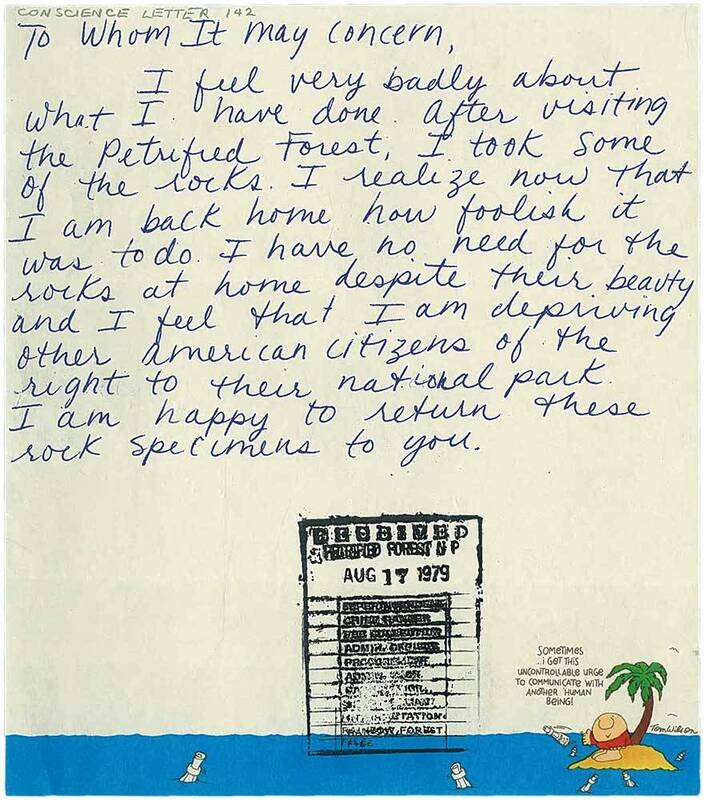 Knowing theft was a problem, the park staff were surprised when pieces of petrified wood began showing up in the mail with letters explaining how the person befell various forms of bad luck after taking the wood home. The podcast Criminal did a fascinating episode on theft in the park and the resulting guilt letters which we highly recommend listening to before visiting the park. A 28 mile scenic drive connects the north and south sections of the park with a visitor center on either end. 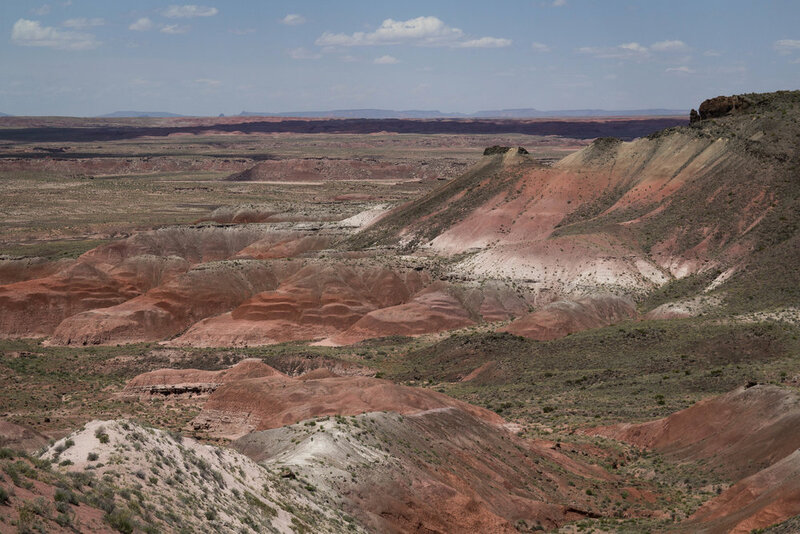 The north side of the park provides beautiful views of the Painted Desert, a badlands region named for it’s brilliant shades of red and lavendar. 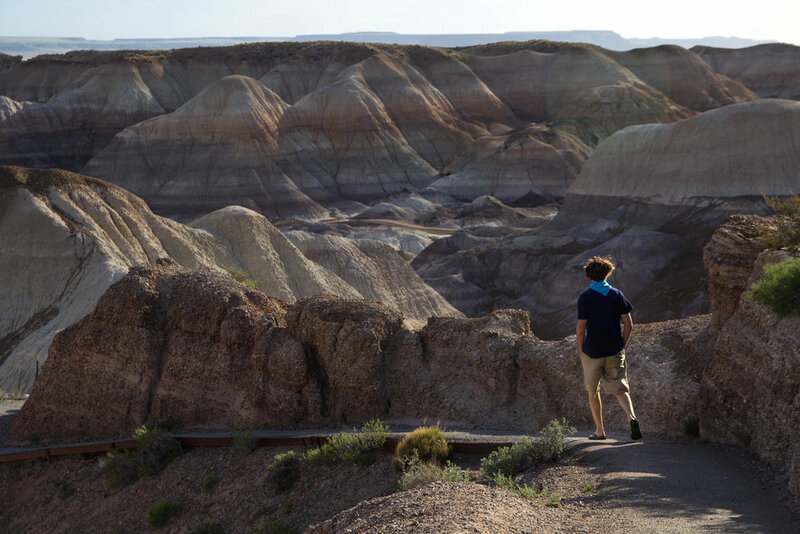 There are several scenic viewpoints, however, if you are on a tight timeline, we highly recommend that you spend your time in the south section of the park where the majority of petrified wood is located. Here there are several stops of interest including ruins, petroglyphs and trails for viewing the petrified wood. Blue Mesa (1.6km loop): a badlands trail that takes you alongside blue, cream and purple striped mesas in an otherworldly setting. Crystal Forest (1.2km loop): one of the best opportunities to experience petrified wood, named for the presence of beautiful crystals. Giant Logs (0.6km loop): an impressive display of some of the largest and most colourful logs in the park, including the nearly 10 foot wide "Old Faithful " (named after Yellowstone’s star attraction). Long Logs (2.5km loop): the largest concentration of petrified wood in the park, with many up to 120 feet long and criss-crossed in the log jam. Our Suggestion: The late afternoon is the best time to bring out the colours in the wood. We recommend exploring the Blue Mesa area in the mid-late afternoon and walking the Crystal Forest Trail at/before sunset. Not to Miss: Both the north and south visitor centers feature a short film on the geologic history of the region which gives a good understanding on how the petrified wood was formed and deposited here.